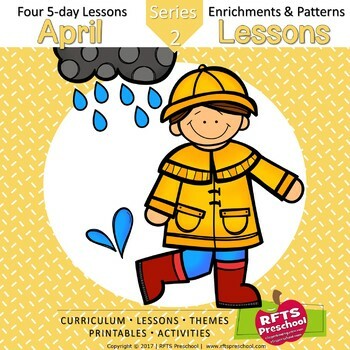 In this unit; we learn about the wacky weather that the month of April can bring. We explore clouds, rain and thunderstorms. Together we study the colors of a rainbow by working together to create a class rainbow using our hand-prints. The children have fun flying a kite and pretend being a meteorologist for a day. In this unit; we discover where milk comes from. We discuss cows, dairy foods and learn about where our food comes from. The children get to experiment with milking a cow. We study the letter J by doing fun activities. In this unit; we celebrate spring with some fun activities surrounding the season. We learn about spring time baby animals. We introduce letter S and the color Yellow. The children have fun making a cool sun craft and baby birds in a nest. The desire to learn is the key to every child’s success. Having fun while learning is so important! RFTS Preschool Program is an exceptionally easy fun early learning program for the preschool age child. To learn more about RFTS Products, visit my website – blog & shop . Keywords: preschool curriculum, program, weekly thematic units, weekly lesson plans, lesson plans (bundled), homeschool kindergarten, prek, preschool program, curricula, curriculum, end of the year, back to school, english language arts, math, holidays, seasonal, prek, kindergarten, home-school, supply lists, art or craft activities, projects, patterns, color, number, letter, alphabet, kindergarten readiness, shape recognition, community helper, sign language, math, science, printables, music, movement activities, literature, recipes for art craft projects, book suggestions, themes, word lists, color enrichment's, cards, posters, puzzles, numbers, letters, flash cards, classroom posters, shapes, field trip suggestions, monthly calendar cut-outs, newsletter, pattern sheets, emergent booklets. planned emergency drills, interactive, child-directed, notebooks, math centers, language centers, cut and paste activity, color by shapes, memory, matching, pre-k, kindergarten, preschool, centers, printables, activity pack, printable package, bundles, print-n-go, classrooms activities, childcare, rfts preschool, rfts, rfts prekindergarten, robyn birge, reach for the stars.